This program, as the name suggests, adds watermarks to images and apart from that can also add text and images on top of current images. One thing that this program does very well is adding the word "Demo" countless times to the images you're working with. With that said, the program does have a usable interface though many users who have purchased a serial key for this program have complained about never having received the key. Indeed that is one reason to avoid this program. Batch Watermark Creator 7.0.4 is a shareware program and can be used as a demo to try the software until the free trial period has ended. A full version of the program is available after the trial period ends. 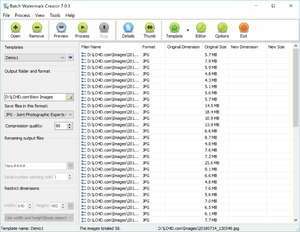 For security reasons, you should also check out the Batch Watermark Creator download at LO4D.com which includes virus and malware tests. Additional screenshots of this application download may be available, too.